Why do some companies achieve things that completely exceed our expectations and defy all of our assumptions for what’s possible? This is a question that Simon Sinek asks the audience as he begins his famous Ted Talk. Sinek, sets out to discover why companies like Apple have been able to achieve such extraordinary success while others, with the same resources, have failed. He explains it through this idea he coined “Start With Why.” And as it turns out, his findings have important implications for inbound marketers too. Want to take your marketing strategy inbound? Check out this lesson. 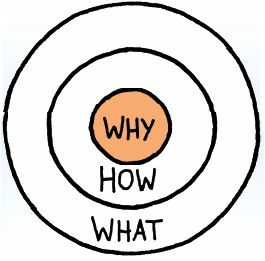 This post summarizes the philosophy behind “Start With Why” and then dives into how it relates to the inbound marketing methodology. To learn more about Simon Sinek, you can check out his website. Sounds simple, right? But what Sinek found is that most companies do their marketing backwards. They start with their “what” and then move to the “how.” Most of these companies neglect to even mention “why.” More alarmingly, many of them don’t even know why they do what they do! Want to learn how to tell your story? Check out this lesson. While these facts are true, I’m not sold. We want to know whythey are great and user-friendly. Turns out Apple has figured this out over the years and knows better. Here’s what a real marketing message from Apple might actually look like. See how different that feels? Because Apple starts with “why” when defining its company, it’s able to attract customers who share its fundamental beliefs. As Sinek puts it, “People don’t buy what you do. They buy why you do it.” Starting with “why” makes Apple more than just a computer company selling features, and that’s why their products have flourished while their competitors’ products with similar technology and capabilities have often flopped. 1. Take a step back and use “why” to think about your own business. Do you know your company’s “why”? (Hint: It’s not to make money.) Think about the core purpose of your business, and then think about how you market your products or services. Are they aligned? As Sinek has found, having loyal customers is all about attracting the people who share your fundamental beliefs. Remember: People don’t buy what you do. They buy why you do it. 2. Incorporate “why” into your marketing copy. If you don’t know the answers to these questions, it’s ok! You don’t necessarily have to scrap your buyer personas and start over. Just add more context to who they are and how they identify with your “why.” Doing so will get you to start thinking about the internal motivation that goes behind their purchase decisions. Perhaps you are a small business with large competitors and your customers are loyal to you because they like to support the little guy. Maybe you’re making the world a better place, and your customers love you because they believe in your cause. Whatever the reason, redefining your buyer personas to match your “why” is critical in creating marketing that inspires them to continue advocating for you. When someone believes in your “why,” they’re more than a lead or customer; they’re an evangelist.